Discussion in 'Computers, Cabling & Other Miscellaneous Hardware' started by tuppetsdad, Sep 24, 2011. Got some of these this week from Ray for $76 each. They are rated at 1 Amp per output (max 24V) and you can set the DMX address manually without software. Next week we will give them a try with some of our RGB strips (looks pretty good for up to 6-7m strip). Small size (90 x 140) and light weight (100 gm) makes then low cost to ship. Let you know how we go. only you can find something as good like that. great find,wonder it they would work up to 28v? Yes the L330 (3 Amp Version) costs $126 per unit plus shipping and we don't need such a big current. These are also a good alternative. Give us a week or so SA and expect a review, although we can't test them at 28V. Have 8 of these little guys so need them to work! Got our 24 Channel Dimmer modules today and they are very neat. As you can see they have nice plastic boxes designed for either screw mount or DIN Rail mounting. The board inside is a SMD based PCB. So two units take up the same space as the Tiger 48. Build quality looks good and brand is "No Name". coupled with its daughterboard the SEM PING SPC-240, looks like a winning combination! Thanks for the pics TD. Ray has stock as he had a minimum he needed to get in. Set the address to 100 with the rotary switches, connected 24VDC, hooked up the ENTTEC Pro and the RGB strip and switched on. Worked first try.......oh so nice considering our first Lynx 16 took us months to bring to life.... changed the address powered down and up again and the new address also worked. Checked the sensitivity by incrementing each colour level from 0 through to about 50. You can see a clear difference in each step up to about 15 and then the incremental difference reduces but still a big difference when you hit with the full 255. Also setting a level of 1 the intensity is actually very low. With the 24 outputs you can control 8 RGB strips and at 100 gm weight and small size (90 x 140 x 40 mm) this unit has a lot of possibilities. It's only really limited by it's IP rating (IP20). Still you could put into a small box easy enough, either with or without the supplied plastic frame. Handles 24V 5050 RGB strips with 60 LED's per meter up to about 6m (max 1 Amp per colour) but will be less with 12V RGB strips. Most people buy 5m rolls so suggest you get the 24V version. Just curious, does this thing work standalone? Any internal memory? 99% certain (as I haven't looked at specs for a while) that this is just a dmx dimmer control. 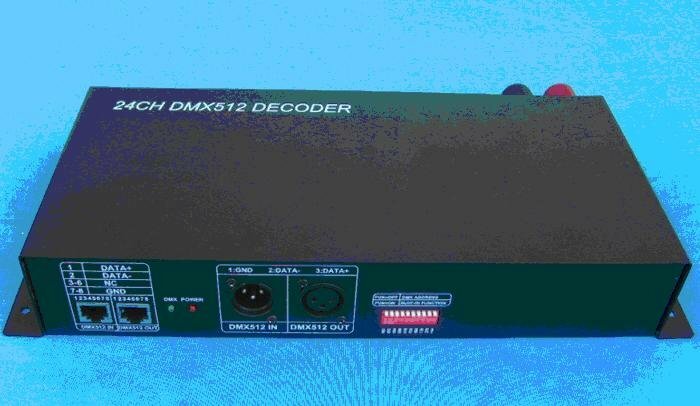 Either a hardware or software based dimming control will send out the dmx info and this box will convert that to the required pwm level to give the desired brightness. Yes AAH is correct no memory just a dimmer, but a good one.